I am a show breeding enthusiast who will likely remain on the small end of the scale in terms of quantity. In quality, I hope to remain committed to my study and support of the welfare and advancement of the breed. I enjoy the challenge of competition, and the pride in a well presented team. I breed to try to give something back, to make a positive contribution, and also to create a living art form that is both pleasing to the eye as well as sound and functional. Breeding is a serious undertaking and responsibility, with both joy and heartbreak, and I am thankful for the resources that have allowed me to pursue my dream. I give full credit and thanks to my daughter Chelsea, who, without her unwavering support and enthusiasm, I would not even be able to try. This is our home, not a kennel - the puppies are whelped in the living room, grow up in the kitchen, and everyone is expected to get along as well as in any other large family. We each pick a spot for the Saturday night movie and popcorn, and we are a happy, noisy group. I hope to share some of my goals and accomplishments, hopes and dreams on these pages, maybe lighting a spark of interest in someone who may not have yet lost their heart to the Shetland Sheepdog, as I have. To my fellow fanciers, I welcome your visit and comments, and hope to see you at ringside soon! 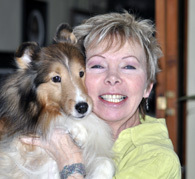 Brenda with my Cady - "Ch Laureate Cadence"